In the week's only matchup of undefeated teams, the Atlanta Falcons travel to the motor city to take on the Detroit Lions. The Falcons offense has picked up right where it left off last year, blitzing teams with a potent combination of passing and rushing. The Lions, a surprise 2-0 team, have done it with pass defense and a stout front seven. This one figures to be a shootout as the Falcons scoring will likely push the pace, so look for fantasy points should be plentiful. Matt Ryan has been a disappointment for fantasy owners so far, but that has been a product of luck and game plan, not efficiency. Ryan is completing almost 70% of his passes and the Falcons are scoring in bunches, but Devonta Freeman has nabbed most of the fantasy points. The Lions have been lights out against the pass so far this year but the Falcons are a huge upgrade from the Giants or Cardinals. Matt Ryan is a lock as a QB1. Devonta Freeman continues to roll in the Falcons high power offense. Also, after a 50/50 carry split with Tevin Coleman in week one, Freeman regained backfield dominance and out touched Coleman 21 to 8. The Lions defense has been great against the run, but haven't faced competent rush offenses. It's a tough matchup but Freeman still checks in as a RB1. Julio Jones has yet to find the end zone this year but remains the premier weapon in the Falcons' offense. After a sluggish week one effort, Jones was targeted 9 times and compiled over 100 yards. Darius Slay presents a challenge but Jones is as dependable WR1 as there is in the game. Despite returning to his role as second fiddle to Devonta Freeman, Coleman still offers value. He should continue to see at least seven rush opportunities a game and has improved his receiving prowess collecting eight targets so far this season. He will always have a capped ceiling, but Coleman represents a possible flex play despite the tough defensive matchup. Mohamed Sanu has established himself as the clear second option in the passing game for the Falcons, and that is a good place to be. He has 15 targets over the past two games and presents a high floor PPR flex option against the Lions and moving forward. Matthew Stafford threw for his second lowest yardage total of his career last week as the Lions game plan called for a very un-Lions like 29 carries out of the backfield. That will probably not be the case against the Falcons. 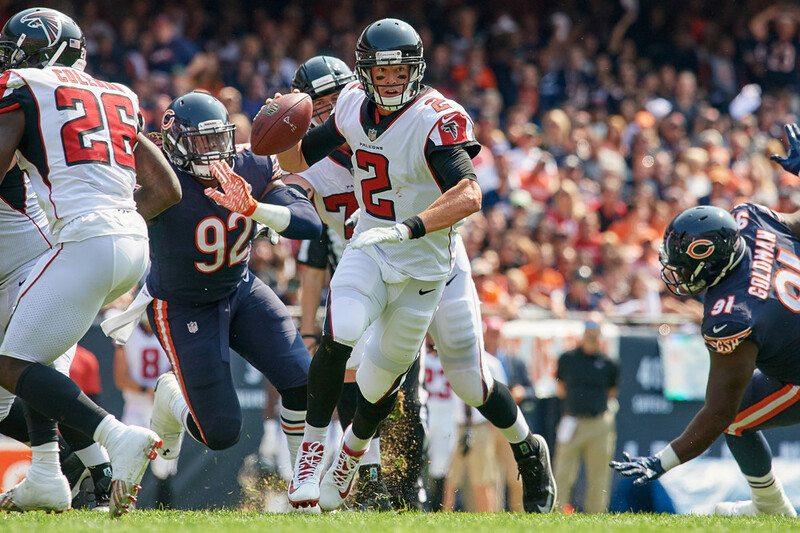 Atlanta's pass rush overwhelmed Green Bay last week but will be missing Vic Beasley who is out with a hamstring tear. If the Lions can give Stafford time, he should have a good day. In a presumed shoot out, Stafford is a solid QB1. For a team that was allergic to the run last year, Ameer Abdullah sure does have a lot of carries. His 32 totes rank him 12th in the league. Outside of a 34 yard run against the Giants he is only averaging 2.65 yards per carry, but the volume alone makes him a high floor RB2. The Falcons have been good up front but Abdullah should see the touches to have a serviceable day. Golden Tate had a quiet day against the Giants, but again, that was more a product of game plan than involvement. Tate still has 16 targets over two weeks and is the favorite target in a still pass happy offense. That being said, over the past two season he only averages 11.5 yards per catch so he is a much safer start in PPR leagues where he is a WR2 vs. standard leagues where he is more of a flex candidate. Despite Ameer Abdullah garnering the majority of the backfield carries, Theo Riddick still carried the rock nine times and almost matched Abdullah's snap count (28 to 27.) The rush-first approach in week two did not favor Riddick, but the presumed shootout with the Falcons should. And considering that pass catching running backs Tarik Cohen and Ty Montgomery victimized the Falcons defense, Riddick makes for a high upside flex play. Coming off one of his better days as a pro, Eric Ebron presents a sneaky streaming option in week three. The Falcons defense has not been good against the tight end so far this year, allowing 13 catches for 139 yards. While he is a risky pick with a low floor, Ebron could pay dividends.